Many years ago I began work on a challenge hack for Super Metroid. After a huge hiatus I decided to pick up where I left off. I discovered that my previous creation was definitely challenging, but the fun factor was very low as there were many cheap deaths, ugly rooms, bad design decisions, etc. 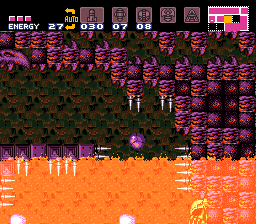 Luckily, I was able to identify many of these things with fresh eyes, and what I hope I have now created is a Super Metroid difficulty hack that is both challenging and fun for players who want a fresh experience with the game. I have changed none of the core mechanics of the game, but you will need to know them well. The thing you will notice most immediately is that you can not even complete Ceres Station unless you understand wall-jumping. As a warning, there are some tricks you will need to either know or learn to beat this hack. None of them are particularly difficult to perform or to learn, but they do include mock-balling, wall-jumping, and short-dashing (not super short dashing!). Each of these can easily be looked up online and learned in a few minutes. However, I did not take the approach to difficulty that hacks such as Metroid Impossible have where you must rely on save-states to survive if you are any less than a Super Metroid God. I tried to balance it so that it could potentially be played on a legitimate SNES cart without too much frustration if in very competent hands. 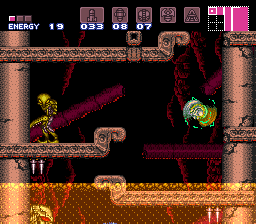 Now I recognize that hacking Super Metroid simply to make it more challenging is not a spectacular thing at all. If you are someone who has already played 100 of these things, then you may like to pass up on this hack. However, and of course I have creator's bias, I think that the level of quality in this challenge hack is above average. Ultimately though, you all are the true judge. -New challenges that will force you to think in creative ways. -More difficult enemies and bosses. -Removal of some (not all!) sequence breaks. If you manage to beat this hack, then post here with your time, completion %, and whether you used save states or not, along with a screenshot to prove your victory. I'll put the time/%/username of every person who does this at the bottom of this post, and note that because of ammunition changes, the max percent will be much less than 100%. Most importantly, have fun with it. It's Super Metroid!